The silver trimmings were transferred from an older dress to the new one. 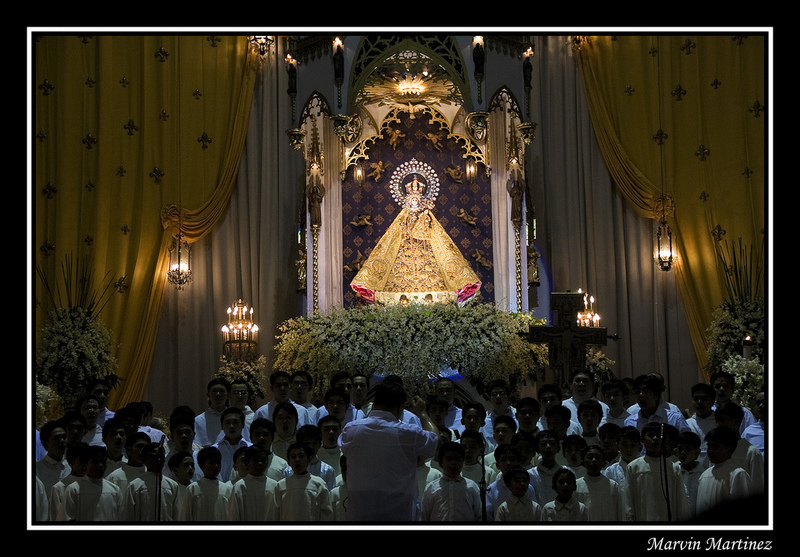 Thank you to rg_Lazaro of Flickr for letting us post these very beautiful pictures of the Santo Rosario here! Posted with permission. All rights reserved. Please respect intellectual property rights. Ask permission from the owner if you wish to republish these photos. I am Christopher Galgo, from Olongapo City. 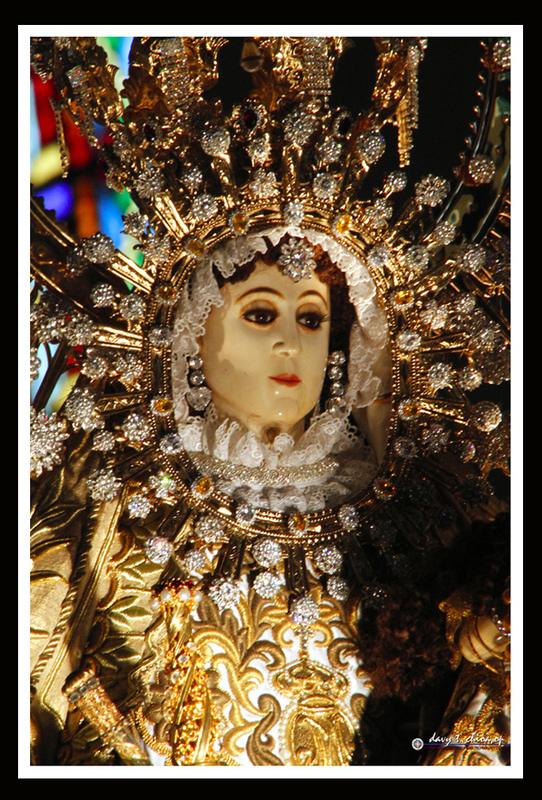 Me and my family are devotees of the Blessed Virgin Mary under the title of the Queen of the Most Holy Rosary, La Naval de Manila. Our devotion developed since my elementary days when I learned the story of La Naval de Manila featured in Fr. Patrick Peyton's Family Rosary Crusade . I am now in my 26th year. The Blessed Virgin Mary has granted us many favors, spiritual and material, and miracles. And we continuously experience Her intercession in our day to day endeavors. 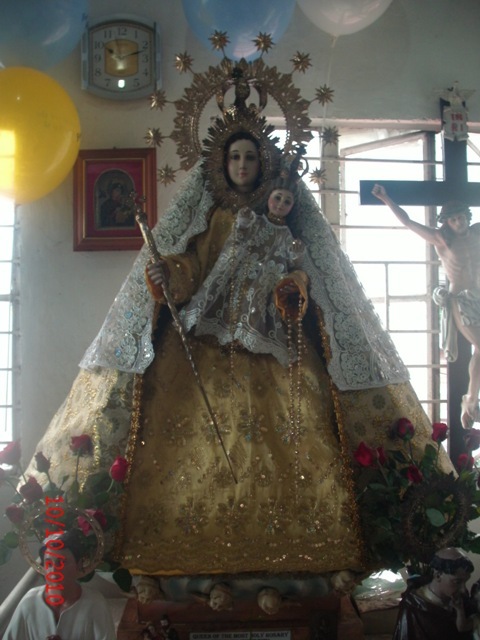 We have our own image of La Naval in our family chapel inside our house, three feet in size, together with other statues of the Blessed Virgin Mary and some saints. La Naval serves as the Queen and Mother of our Home, our Soul and our Heart. She is our only refuge in times of crisis and dilemmas. One of the miracles of the Blessed Virgin Mary in us, as well as in the lives of our neighbors, was, when a huge fire incident happened in the year 2002 that has struck and almost burned our owned apartment. Our neighbors pleaded for Our Lady's intercession and succor. She granted our prayers and immediately the fire has stopped thru the help of some fire marshals. We have also experienced spiritual battles. 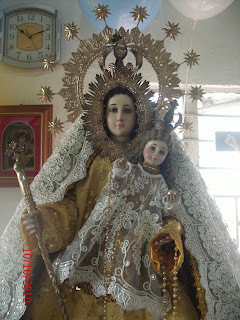 But our dearest Mother is so generous that she always give us the triumph over our most difficult problems, as she had manifested over the Battles of La Naval de Manilla. I have not became a Licensed Social Worker without the help of Our Lady. She has helped me a lot during my collegiate years and gave me my license after I have Passed the Licensure Examination for Social Workers. I have taken the Board Exam only once. 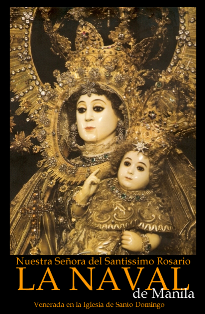 But before that, I have conducted a novena in honor of Our Lady. With knees bent, everyday I plead for Our Lady's help and mercy. She once again proclaimed that She is the Victorious Queen of the Rosary. 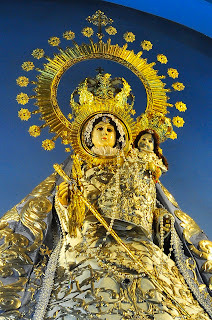 I will not mention in detail all the blessings and miracles of La Naval to us because my whole life will not suffice to proclaim and narrate Her greatness. Every 2nd Sunday of October, annually, we celebrate the Feast of the Triumphant Queen together with our friends. The celebration includes the recitation of the Holy Rosary, Holy Eucharist and Luncheon Feast. Everyday (afternoon or night-depending on one's availability) we have an alternate duty of rosary prayer in front of Our Lady's image in thanksgiving for the whole day blessings. Hoping that this could inspire more devotees to continue praying to Our Lady, even if their requests were not yet and / or easily granted by heaven because God's and Our Lady's way and time are not man's. But I'm sure that their way and time are the best for ours. VIVA EL REINA DEL SANTISIMO ROSARIO!!! VIVA LA VIRGEN DE LA NAVAL!!! Beautiful Mother. Pray for Us. Thank you to Mr. Davy Chioa, Mr. Marvin Martinez & Flickr User gLn98 for letting us post these very beautiful pictures of the Santo Rosario here! I just want to share the miracle done by our lady of la naval. the day after the day we celebrate her feast last October 10,2010... My officemate's niece was very ill that time, her white blood cells reach at 18,500 counts which is not normal for a 8 months old child...and the child always suffer 40 degrees Celsius fever and her red blood cells also dropped... the family especially the mother of the child don't know what to do and very much depressed... that time October 11,2010 I convinced my office mate to go with me to Sto. Domingo church, and to pray to our lady, without hesitation she goes with me... I myself also said a prayer to our lady for the child... Sabi ko pa nga sa mahal na ina. "mahal na birhen ng La Naval, wag mo po ako ipapahiya sa pamilyang to, hayaan mo po makilala ka din nila at ipamalas mo po ang iyong pagmamahal sa kanila" so after we pray, my officemate and I separate ways and go home...the night came I received a text message from my office mate saying thank you to me cause her niece was healed the time that we are in Sto. Domingo that was also the time when her niece is on St. Lukes. having her test, after the test the results was all negative and the white blood cell counts decreased into normal count.. I told her not to thank me instead thank our mother who help us. 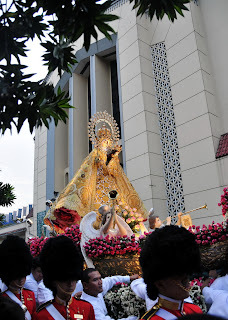 I thank God for what happened and thank Mama Mary for her intercession... Viva La Naval de Manila!!! Oktubre 1-9, 2010 - mula 5:30nh hanggang 7:00ng. Oktubre 10, 2010 - mula 4:00nh hanggang 7:00ng. Oktubre 10, 2010 - sa ganap na ika-8 ng Umaga para sa isasagawang Solemn High Mass. Magkakaroon lang ng mga Live Updates sa Lahat ng mga TV Channels kaugnay sa ating Pagdiriwang ng La Naval de Manila sa darating na Oktubre 9-10, 2010!!! Simbahan ng Santo Domingo sa Lungsod ng Quezon, Republika ng Pilipinas. Sa ating isasagawang Engrandeng Prusisyon para sa ating Pagdiriwang ng LA NAVAL DE MANILA. ito ay posibleng magtatagal ng mahigit Dalawa at Kalahating Oras ang isasagawang Prusisyon. at ito ay posible rin maglulan ng mahigit sa 7,000 hanggang 10,000 katao ang dadalo sa darating na Araw ng Linggo, Oktubre 10, 2010!!! Enthronement of the Image 5:00 pm. Monday - Saturday: 5:00 am. - 12:00 noon. at 6:00 pm. Sunday: 5:00 am. - 12:00 noon. - 4:00 pm. at 7:00 pm. Novena: 6:50 am., 11:45 am. at 5:30 pm. 5:00 am., 12:00 pm., 3:00 pm., 5:00 pm. at 7:00 pm.